In November 2014, at the 25th APEC summit in Beijing, President Xi Jinping announced the USD 40 billion Silk Road Infrastructure Fund, raising awareness of China’s new regional strategy at the world stage. Outside observers had been debating how China would react to the US-led TPP negotiations and the ASEAN-centered Regional Comprehensive Economic Partnership (RCEP). Expectations had risen, in the United States, that China would carry out domestic reforms in order to join the TPP, as it did on the way to WTO membership, and in Asia’s capitals, that China would support RCEP strongly to counter the pressure of TPP. In the summer of 2014, I interviewed policy elites in Beijing and surveyed written works in Chinese to assess the validity of the two expectations of China’s multilateral choices. What I discovered was deep skepticism of the TPP process and ambivalence toward the RCEP framework, while what these elite respondents truly preferred and actively promoted was the new Silk Road strategy. In order to gauge preferences and responses to regional multilateral talks and gain the most valid inference on China’s policy choices and regional behavior, I rely on two approaches: interviews of policy elites and surveys of published Chinese sources. The former are selected by their experience and position. There are only twelve of them, but they represent the government, research institutes, and the scholarly community. Four came from the ministerial-level think tank (Chinese Academy of Social Sciences, CASS), two from the Ministry of Foreign Affairs, two from the Ministry of Commerce, one is a specialist on regionalism and a track two negotiator, two are managers of a SOE, and one is an academic who has been retained as a consultant for the central and local governments. Among them are key CASS researchers on China’s regional policies—the dean of the Asia-Pacific and Grand Strategy Institute [Yatai yu daguo zhanlue yanjiuyuan], a senior researcher on Sino-Japanese relations, another researcher on ASEAN, and a fourth one specializing on TPP. These semi-officials and specialists are highly attuned to policy preferences in the government and lead policy discussions and research in the scholarly community and in society at large. The individuals in the government are all at the medium rank with more than ten years of experience working for their agencies in relation to Asia and globalization. They not only have knowledge of China’s regional policies but also have acquired experience and perspectives generally unavailable to outsiders. The managers of the SOEs are among the select group who help make corporate strategies for their respective companies. Each interview lasted one-to-two hours and was conducted in an open-ended format with both structured interview questions and a free flow of opinions. The respondents, whom I call policy elites, were frank in expressing their opinions on what frameworks worked for China and providing policy information that they gained from their work. The second part of my research was analysis of published Chinese journal and newspaper articles on various regional options. I used the China National Knowledge Infrastructure (CNKI) database, the most authoritative and inclusive Chinese database, including many print sources with a government or party connection. The authors or viewpoints cited are both semi-official and unofficial. Many of the journal articles were produced with direct government funding, such as national social science research grants. This combination of sources offers good coverage of China’s policy preferences and likely impending choices. The findings show that the prevailing view regarding TPP was skeptical and resistant. In the written works, TPP was seen as a challenge, whose severity China can neutralize by forming counter-TPP multilateral frameworks. Less common was the view that China should seek to join TPP as soon as possible to use its pressure to push domestic reforms. On RCEP, the policy elites had a range of opinions. Those who worked on regionalism praised China’s intensified interest and support for RCEP and ASEAN-led regionalism; however, they were also frustrated with what they viewed as “aggression by these small countries in the territorial disputes.” Experts at the think tanks are not enthusiastic about RCEP, citing wide differences in development levels, culture, and political systems. In general, the policy elites are skeptical of the benefits to China and feasibility of regional integration via this framework, demonstrating no enthusiasm about having China subject to ASEAN’s leadership. My findings on the New Silk Road were unintended; yet it was clear from the interviews and subsequent analysis of articles that this strategy is being presented as the preferred regional framework to compete with TPP and RCEP. The New Silk Road Strategy has received the highest support from the political leadership, senior agencies, and local governments. It is already being implemented and is likely to drive China’s regional policy for years to come. China’s attention to the TPP negotiations was piqued more by Japan than by the United States. To 2009, according to the CNKI database, there were no TPP-themed articles, including news articles, despite the US decision to join in 2008. In 2010, ten Chinese articles were published on it, but eight were on the prospects of Japan joining. From Japan’s announced interest in joining in late 2011 to its formal participation in March 2013, 350 articles were published, the vast majority to analyze whether, why, and how Japan’s participation in TPP would influence China. In 2014, another 153 articles were produced on China and TPP, and almost all of them are about how China can respond to the potentially largest trading bloc in China’s backyard. 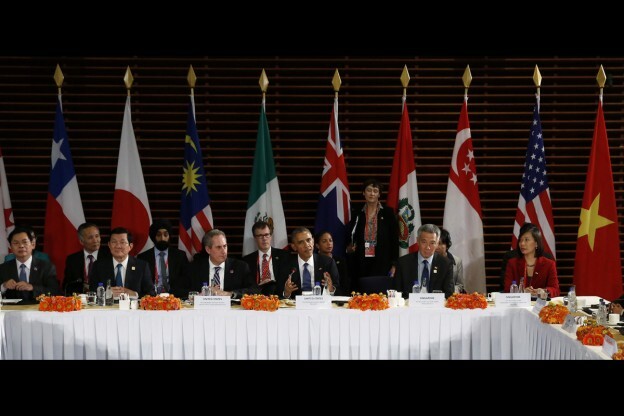 There has been a high-degree consensus regarding America’s motives in leading the TPP negotiation. According to the Chinese opinions, there are three goals in America: 1) to deepen economic ties between America and its Asian allies, 2) to provide backbones to America’s rebalance to Asia policy, and 3) to shape new rules in the region and in the world. There has also been a high-degree of consensus on how TPP is challenging China. The standards espoused in the TPP talks differ on many dimensions from those espoused by China: 1) on SOEs and the government’s role; 2) on labor and the environment; and 3) on intellectual property rights and supply chain regulations. Each has potential to weaken China’s existing economic presence in the world; however, regarding how China should respond to the pressure or challenge from TPP, there has been a clear divergence. Other specialists have been more sobering, treating TPP as a competition between the United States, the global leader, and China, a regional rising power. Liu Chongli and Yang Hong, for example, criticized the US use of TPP to rebalance to Asia for its disruption of regional integration in Asia Pacific. In response, they argue that China needs to readjust its strategy, keep its FTA priority in East Asia, improve the usage of FTA among Chinese companies, and keep a close eye on TPP, making preparations for eventual participation in the negotiations.8 They also stressed the importance of using alternative, Asia-track trade talks to counteract the challenge of TPP. Even in the publications on RCEP and other Asia-centric issues, there are signs of ambivalence on China’s part. Skepticism is evident that the diverse membership structure in RCEP seriously undermines the feasibility of a successful conclusion. Further, Chinese policy elites are sober about the actual benefits that China could gain from RCEP. Overall, there is unmistakable unease over China’s subordination to the ASEAN leadership, despite the official rhetoric that China respects ASEAN centrality. During my interviews, the diplomats and track two regional scholars provided me with detailed information on what China and ASEAN have achieved since 2008. First, they all believe political and territorial disputes between China and its East Asian neighbors are major inhibitors to cooperation. Between China and Japan, no matter what progress the diplomats and track two scholars achieved, once political tensions broke out, the progress would be thwarted. Second, they positively assess the multilateral cooperation that China has achieved, but focus on China’s increased support for regionalism under Xi Jinping, citing the landmark speeches, proposals, and funding for multilateral cooperation in East Asia. Third, to varying degrees, they feel ambivalent about ASEAN centrality. On the one hand, they recognize that China cannot lead due to competition from Japan and the resistance of ASEAN, and ASEAN centrality works for China’s goals in East Asia. On the other hand, they are frustrated with the lack of concrete and more far-reaching achievement in the region due to AEAN’s emphasis on ASEAN centrality. The response to the New Silk Road Strategy was clearly different from the skeptical resistance to TPP and cautious support for RCEP. All the interviewed expressed strong and unqualified endorsement for this initiative of Xi Jinping and explained to me why the silk road strategy has become the dominant dynamic in China. Publications not only confirm the profound support for the strategy from official, semi-official, and unofficial sources but also provide the programs and projects that have been proposed and implemented in China for this strategy. The New Silk Road Strategy was first broached by Xi Jinping during his visit to Kazakhstan in September 2013, when he called for construction of the “silk road economic belt” [sichou zhilu jingji dai] connecting China and Central Asia, onward to Europe. A month later, when Xi was visiting Indonesia, he proposed the “21st Century Maritime Silk Road” [ershiyi shiji haishang sichou zhilu] between China and Southeast Asia. Commonly known as “yidai yilu” [One Belt, One Road], the New Silk Road Strategy invokes a historical trade route connecting China with Europe via Central Asia during the Tang dynasty, reportedly the most prosperous, globally influential, and open-minded period in China’s history (608-907AD). The proposed silk roads begin with China’s coastal region, traversing the vast central and western interiors, and exit from Xinjiang, onward to Central Asia and West Europe. They promise to bring Chinese manufacturing products and investment to Central Asia in exchange for raw materials and energy resources. For such and exchange to work, infrastructure—railways, airports, highways, and factories—are proposed in China’s interior and in the countries in Central Asia. China would be able to stimulate growth in its backward interior provinces and use its surplus funds to expand influence in the region. At the Third Plenum of the Eighteenth Party Congress held in late 2013, the leadership reaffirmed the New Silk Road Strategy as a grand strategy. In the Government Work Report to the National People’s Congress (NPC) in early 2014, Premier Li Keqiang further explained it. Nine provinces in the interior are included: Shaanxi, Gansu, Qinghai, Ningxia, Xinjiang, Chongqing, Sichuan, Yunnan, and Guangxi, and five provinces in the coastal area are included: Jiangsu, Zhejiang, Guangdong, Fujian, and Hainan. Policy research, proposals, and infrastructure construction in many places started in mid-2014. According to the policy elites, Xi’s Silk Road Strategy is a result of the self-reflection by Chinese elites.19 After more than 30 years of reform and opening, China has become the world’s second largest economy, benefiting from economic globalization. In the next 5-10 years, China is likely to become the world’s largest economy. What kind of economic power does China want to be? How should it best expand its external influence? To support the New Silk Road Strategy, according to the policy elites I interviewed, the CCP held an unprecedented work forum on Chinese diplomacy toward the “periphery” [zhoubian diqu, that is, the land and maritime areas adjacent to China] on October 24-25, 2013. This was the first major meeting on foreign policy since 2006 and the first forum specifically on periphery diplomacy since the establishment of the PRC in 1949. It was attended by the entire standing committee of the Politburo, various organs of the Central Committee, state counselors, the central small leading groups with responsibility for foreign affairs, and Chinese ambassadors to important countries. At the forum, Xi Jinping offered guidance designed to enhance political goodwill, deepen regional economic integration, increase China’s cultural influence, and improve regional security cooperation. The articles demonstrate that industrial ministries in Beijing and influential local governments have backed the New Silk Road Strategy. After the work forum was concluded, three ministries, (the National Development and Reform Commission or NDRC, the Ministry of Commerce, and the Ministry of Foreign Affairs), started policy deliberations and research on how to implement the new strategy. Under the NDRC’s influence, local governments in interior and coastal areas put together industrial and infrastructure proposals for the center’s approval. A Silk Road Conference was held in Beijing in late 2013 and was attended by major SOEs, banks, local governments, think tank researchers, and ministers from the NDRC. This meeting not only communicated the leadership’s strong will to push for speedy implementation of the Silk Road development program but also revealed strong interest in the development program at the corporate and local levels. At the Sino-Arabic conference in late 2013, Chinese delegates promoted the Silk Road development vision and, according to the Chinese media, the Arabic countries along these routes were eager to be engaged as China’s regional counterparts. My “discovery” of China’s New Silk Road Strategy was rather fortuitous. During the interviews, specialists at CASS were informative about China’s opinions on TPP and RCEP but also depressing as none of them felt strongly about the multilateral talks. They showed equally ambivalent views on the China, Japan, and South Korea trilateral talks, citing political tensions in Northeast Asia. Only after an awkward lull in the open-ended interviews, my host proffered that the real progress in China’s multilateral regionalism was in Xi’s “One Belt, One Road” proposal. Then our conversations were all centered on their passionate explanations of the Silk Road Strategy and why it was critical to China. Armed with knowledge of the New Silk Road Strategy, I conducted the other interviews by starting with questions on China’s responses to TPP and RCEP and then ending with open-ended discussions on the Silk Road Strategy. Their enthusiasm toward the New Silk Road Strategy confirms the findings at CASS, and was confirmed by the written sources in China. Using “yidai yilu” in a keywords search, I found the Silk Road Strategy to be gaining rapid attention. In the CNKI database, there were no articles written on the Silk Road strategy in 2013, but by October 2014, there had been 168 on this new vision. Most are news reports on the conferences and activities related to the New Silk Road Strategy as well as statements by the leaders, national bureaucrats, and local officials and SOEs. Second, the attractiveness of the New Silk Road Strategy lies in its development potential. Along the Silk Road construction route are mostly interior regions, which had fallen far behind coastal China in economic development. By implementing the New Silk Road Strategy, China is embarking on a new wave of “yi kaifang cu gaige” [use openness to deepen reform], deepening market liberalization and investment flows in interior regions. Lastly, the New Silk Road fits China’s economic strength better than the TPP or RCEP. In October 2013, Xi laid out the primary means for implementing periphery diplomacy, which centers on constructing silk roads in trade, investment, manufacturing, energy, and currency, accelerating the pace of the free trade zone strategy across China’s borders, and making active arrangements for the establishment of the Asian infrastructure investment bank (AIIB). Infrastructure development has been the focus of China’s development. The country has surplus technology and funds that it can invest in Central Asia and Southeast Asia to grow the market for Chinese manufacturing products. As production costs rise further in China, Central Asia, with proper infrastructure, may offer a viable site for relocating Chinese manufacturing. In the process, government coordination and large SOEs will be strengthened. Based on interviews and Chinese articles, I found that Chinese policy elites ranked the New Silk Road Strategy much more highly than TPP or RCEP. However, by focusing on economic development ties, the Silk Road Strategy provides an opportunity for the United States and Asian countries that join in TPP and other transnational economic undertakings to work together. Despite mutual competition, these trade talks offer the prospect of using American and Chinese economic strength to benefit peripheral nations, in addition to benefitting the lagging populations within China. Ideally, the New Silk Road strategy can include greater American and other Asian investment in the kinds of infrastructure and other projects that would benefit many peripheral states. Leadership priorities and elites’ opinion may change, due to critical uncertainties in domestic and external environments. Under specific circumstances, TPP, RCEP, or other regional initiatives may become more attractive to policymakers. The New Silk Road Strategy may encounter difficulties, considering the political/ethnic turmoil in Xinjiang and Central Asia. At this point, however, China is banking on the Silk Road development. The longevity and power of Chinese political leadership and the stable structure of policy elites will help to maintain the priority given to the New Silk Road Strategy in China. 1. Li Xiangyang, “TPP: Zhongguo jueqi de zuida tiaozhan,” Guoji jingji pinglun, no. 2, (2012). 2. Shen Minghui, “A Cost Benefits Analysis of the TPP: A Chinese Perspective,” Dangdai yatai, no. 1, 2012, 6-34. 3. Tang Guoqiang and Wang Zhenyu, “Yatai quyu jingji yitihua de yanbian, lujin ji zhanwang” Guoji wenyi yanjiu, no. 1 (2014): 96-116. 4. Fan Yongming, “TPP yu xinyilun quanqiu maoyi guize de zhiding,” Guoji guanxi yanjiu, no. 5 (2013): 3-15. 5. Shen Minghui, “TPP zuixin jinzhan yu Zhongguo duice,” Dongfang zaobao, March 27, 2013. 6. Fan Libo, “Meiri TPP zhanlue yu Zhongguo de yingdui, Xiandai guoji guanxi, no.12, (2012): 55-60. 7. Liu Chanming and Sun Yunfei, “Guonei guanyu ‘kua Taipingyang hoban guanxi xieyi’ yanjiu zongshu,” Lilun xuekan, September 2013, 81-87. 8. Liu Chongli and Yang Hong, “Meiguo chonghui yazhou dui Zhongguo Dongya diqu FTA zhanlue de yingxiang,” Dongbeiya luntan, no. 5 (2012): 48-59. 9. Wang Yi, speech at China-ASEAN Senior Officials Forum, August 2, 2013, www.mof.gov.cn. 10. Li Keqiang, speech at the 8th ASEAN Regional Forum, October 11, 2013, Brunei, www.mof.gov.cn. 11. Chen Shumei and Quan Yi, “TPP, RCEP tanpang yu Yatai jingji yitihua jinceng,” Yatai jingji, no. 2 (2013): 3-9. 12. Wang Jinqiang, “TPP dui RCEP: Yatai diqu hezuo beihou de zhengzhi boyi,” Yatai jingji, no. 3 (2013): 15-21. 13. Chen Shumei and Zhao Liang, “Dongya hezuo weihe xuanze RCEP erhei TPP?” Dongbeiya luntan, no. 2 (2014). 14. Zhang Zheng, “Zhongrihan jingji hezuo,” Dongbeiya luntan, no. 2 (2014). 15. He Ping and Shen Chen, “RCEP yu Zhongguo de Yatai FTA zhanlue,” Guoji wenti yanjiu, no. 3 (2013). 16. Wang Yuzhu, “RCEP chanyi yu Dongmeng de zhongxin diwei,” Guoji wenti yanjiu, no. 5 (2013). 17. Shen Minghui, “RCEP: cong fensan zouxiang tongyi de quyu shichang,” Zhongguo yuanyang hangwu, no. 6 (2013). 18. Wang Jun, “RCEP de goujian ji Zhongguo yingdui celue yanjiu,” Dongnanya zongheng, no. 4 (2013). 19. “Xi Jinping yidai yilu zhanlue cheng shijieshang zuichang jingji zoulang,” Zhongguo jingji zhoukan, no. 26 (2014).